You ask – what can it do for me? Saw Palmetto from South America and Pollen make the perfect partners for the Bee-MALE special formula. The results are raved by men worldwide. Biologically, the prostate gland changes in men throughout life. Bee-MALE is specially tailored for the lifestyles of men over 30 years of age. Bee-MALE is taken by many men from all walks of life who value their intrinsic biological metabolism – they are delighted! 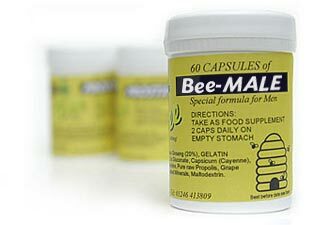 A pot of 60 Bee-MALE capsules will last 2 – 3 weeks, with a daily intake of 3 capsules daily. Bee pollen, Saw Palmetto, Panax Ginseng Powder, Gelatin (capsule), Zinc Gluconate, Asorbic Acid (Vit C 100%), L-Glutamine, Propolis Extract (5:1), Grape Seed Extract, Capsicum Powder, Calcium Gluconate, Maltodextrin, Acidophilus.